Leadership Oakland is a civic and professional development, networking, and leadership training program of the Oakland Chamber of Commerce. 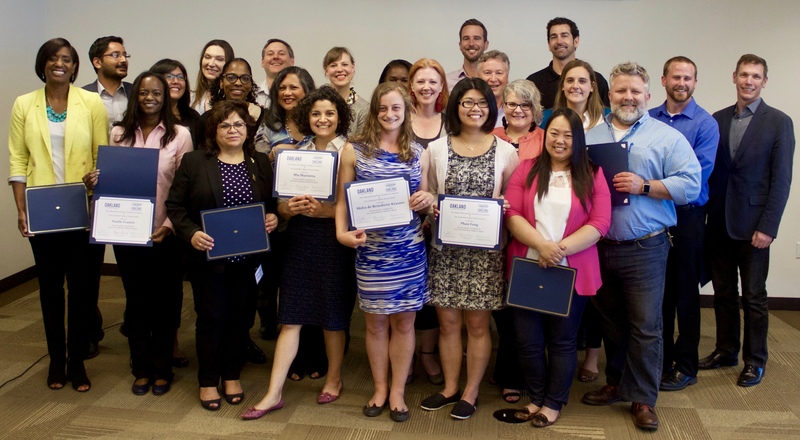 Currently in its 29th year, the program offers Oakland’s current and future leaders the opportunity to gain an in-depth knowledge of the role leadership plays in our city and prepares participants for roles on city commissions, non-profit boards, elected office, and greater community engagement. Cohorts develop a close bond that provides them a valuable network after the program ends. 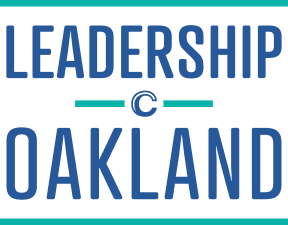 Participants also benefit from involvement with the Leadership Oakland Alumni Association, which hosts mixers and events year-round. Each day-long session is devoted to an in-depth exploration of various topics relevant to Oakland. Participants are introduced to speakers and leaders from the Oakland community. The program also includes several unique site visits and field trips, as well as attendance at the Chamber of Commerce’s Annual Awards Luncheon in June. Sessions are held at various locations throughout the City that align with the curriculum for the day. Each participant is responsible for their own transportation to and from the sessions as well as all parking involved. Participants are encouraged to carpool. What are the commitments and requirements? Previous small group projects have included technical assistance to Oakland nonprofits such as SOS Meals on Wheels, Family Paths, Prescott Circus Theatre, Kiva Oakland, and Facing History and Ourselves. Tuition includes: all program materials, leadership training sessions, breakfasts and lunches, as well as costs associated with Chamber mixers and events free to members, Annual Awards Luncheon, and graduation ceremony. Failure to attend the Leadership Training. More than one absence during the program. Partial attendance at any session in excess of two occurrences. A sincere commitment, motivation and interest in serving the community. Individuals who demonstrate commitment through past or present involvement in the community. Individuals with an awareness and understanding of community and business issues who demonstrate a commitment to Oakland and its future. Individuals who have demonstrated or show potential leadership skills. A nonrefundable $50 application fee plus a $100 tuition deposit is due with your application. Applicants will be notified of their admission status on September 18, 2018 after all applications have been reviewed. Applicants have until 5pm September 21, 2018 to confirm their place in the program or it may be given to a waitlisted applicant and tuition deposit will be forfeited. The complete tuition minus the $100 tuition deposit must be paid in full by Thursday October 4, 2018. If the complete tuition is not received by the day of orientation on October 4, 2018 the applicant will not be able to participate in orientation. If you are not selected for admission, your $100 tuition deposit will be returned. Once a participant has attended two sessions (including the orientation), the tuition is nontransferable and nonrefundable. Checks should be made payable to the Oakland Metropolitan Chamber of Commerce and submitted to the below address. If paying tuition by credit card, an additional $25 processing fee applies.